If music is the universal language, then the songs of the Beatles are its Rosetta Stone. Their heritage lives on through 8,000 tribute bands. Moderated by John Lennon's sister, Julia Baird,"Come Together" is a tribute to the Beatles legacy. Even if you aren’t a Beatles fan, this movie will give you insight into one of the most interesting events ever to hit our culture. ​If music is the universal language, then the songs of the Beatles are its Rosetta Stone. Their compositions are an international language that crosses all borders and overrides cultural differences. Though they no longer exist as the Fab Four, their musical legacy lives on through generations of fans, and the thousands of tribute bands who “come together” worldwide, to interpret and perform their music. There are an estimated 8,000 Beatles tribute bands globally who perform at multiple Beatle festivals and conventions throughout the world. Shot almost entirely in Liverpool, the birthplace of The Beatles, and captured in HD during International Beatle Week, Come Together is a tribute to that legacy…a phenomena that shows no signs of stopping. Paul once said, “A hundred years from now, people will listen to the music of the Beatles the same way we listen to Mozart”. Imitation is the most sincere form of flattery. The lengths some tribute groups go to ranges from simple vocal harmonies, to what are affectionately called “Boots and Suits” bands. Regardless of nationality, they attempt to look and sound as close to the originals as possible. The result is a creative composite of musical expression. The documentary illustrates their diversification in sound and illusion. 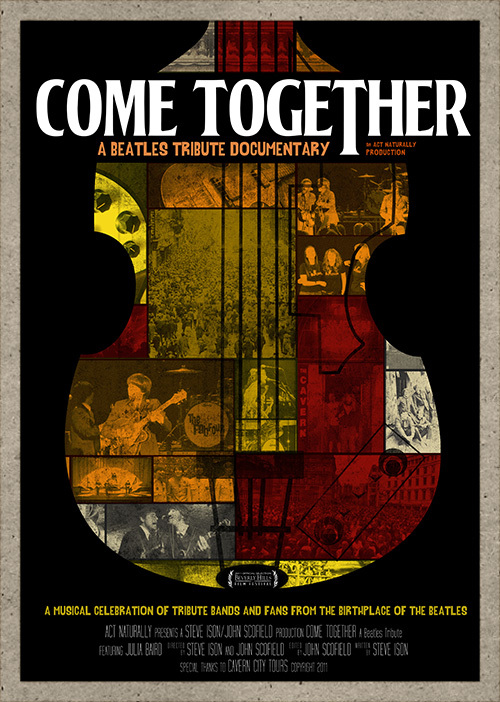 Come Together, moderated on-camera by John Lennon’s sister, Julia Baird, captures that sprit, motivation, energy and interpretation through in-depth interviews, rare footage, stunning concert performances, and personal stories by bands and fans alike. People have come together from Tokyo to Stockholm to Las Vegas to share their love of the music of The Beatles and the positive and uplifting message it brings. This is their tribute to them as well.